This Babylonian "Queen of the Night" is probably a representation of either Ereshkigal or Ishtar. Ereshkigal (lit. "Great Lady under the Earth") was the goddess of the land of the dead, the Underworld, in Mesopotamian mythology. One of the oldest goddesses of Mesopotamia, she was the daughter of the chief god, "Skyfather" Anu, and was the twin sister of the major deity Enki. Ereshkigal was the sole ruler of her kingdom, until she came to share power with the god Nergal, who became her husband and king. Sometimes her name is given as Irkalla, which is also the name of the Underworld itself, similar to the use of Hades in Greek mythology to refer to both the Underworld and its ruler. The main temple dedicated to Ereshkigal was located in Cuthah. Ereshkigal withstood an attempt by her younger "sister" Isthar to usurp her throne in the Sumerian hymn "The Descent of Ishtar," thought to have influenced later myths such as the Greek story of Persephone. The later myth "Nergal and Ereshkigal" describes her love affair and ultimate submission to Nergal as her king. When Anu's tears—shed for for his separated sister-lover Ki (earth)—met the salt waters of the primeval sea goddess Nammu, Ereshkigal and her brother Enki (Ea) were born. Ereshkigal was later abducted by the great dragon Kur, her half-brother, and taken to the Underworld. Enki attempted to rescue her, but this realm became her abode, from which no one, not even the gods, may return. Ereshkigal is the older sister (more properly the aunt) of Ishtar, the goddess of life and fertility. In this sense, she is also her counterpart, the goddess of death and also the symbol of nature during the non-productive season of the year. As the doctrine of two kingdoms—one of this world and one of the afterlife—became crystallized, the dominions of the two sisters became sharply differentiated from one another. Ereshkigal is known chiefly through two myths (see below). One of these is the famous story of "Ishtar's Descent" to Irkalla. The other is the myth of Ereshkigal and Nergal, the god of war and plague, a complicated love story in which Ereshkigal first seduces Nergal and is then overcome by him. He thus becomes the reigning king of the Underworld with Ereshkigal as his queen. Irkalla (also Ir-Kalla, Irkalia) is the Underworld, from which there is no return. It is also called Arali, Kigal, Gizal, and the lower world. Irkalla was also another name for Ereshkigal. The Sumerian netherworld was a place for the bodies of the dead to exist after death. One passed through the seven gates on the journey to the netherworld, leaving articles of clothing and adornment at each gate. It was not necessarily a world in which the spirits lived forever, for bodies of the dead decomposed in this afterlife, as they would in the world above. As the subterranean destination for all who die, Irkalla is similar to Sheol of the Hebrew Bible or Hades of classic Greek mythology. It is different from more hopeful visions of the afterlife that later appeared in Platonic philosophy, later Judaism, and Christianity. Although little is said about him, Ereshkigal once had a mortal husband named Gugalana. His death provides the pretext for Ishtar's visit to her in an attempt to usurp Ereshkigal's throne. With Gugalana she supposedly had a son named Ninazu, a god of the Underworld and of healing. However, in other traditions Ninazu was the son of Enlil and Ninlil. Unlike his relative Nergal, he was generally benevolent. Her son with Enlil was the god Namtar, Ereshkigal's vizier and messenger, who was responsible for diseases and pests. It was said that he commanded 60 diseases in the form of demons that could penetrate different parts of the human body. She was also the mother of the goddess Nungal, the patron deity of prisons, who chases after and punishes sinners. One of the most striking of Sumerian myths, this story describes the journey of the goddess of life and fertility, Ishtar (Inanna in Sumerian), into the Underworld. Her pretext for the journey in the more complete version of the story is that Ereshkigal's husband has recently died, and Ishtar wishes to pay her respects. However, she brings with her seven divine powers and acts aggressively toward Ereshkigal's gatekeeper, Neti. Sensing a threat, Ereshkigal requires that Ishtar pass through seven gates into the "Land of No Return." At each gate, Neti removes an article of Ishtar's clothing and ornaments, beginning with her crown and ending with her loincloth, until at the last gate she is entirely naked. Ishtar immediately attempts to usurp Ereshkigal's place on the throne of the Underworld. In one version of the story Ereshkigal then dispatches Namtar to smite Ishtar with diseases in every part of her body. In another, Ishtar is judged guilty by the other Underworld gods. She is then turned into a corpse and hung on a hook on the wall. Meanwhile, back in the land of the living, Ishtar's absence results in a horrible plague of infertility among both humans and animals: "No bull mounted a cow, no donkey impregnated a jenny... The young man slept in his private room. The girl slept in the company of her friends." Neither Ishtar's grandfather Enlil nor her father, the Moon god Nanna/Sin, is willing to rescue the ambitious goddess, believing she has overstepped. However, by the intercession her kindly and clever uncle Ea (Enki in Sumerian), Ishtar eventually wins release. According to the Underworld rules of justice, however, she must find someone to take her place. Returning above, she discovers her beloved husband, the grain god Tammuz (Dumuzid), seated in splendor on her throne. Enraged, she has him seized and dragged below. She eventually repents of this act and arranges for Tammuz's sister to substitute for him during six months of the year—thus explaining the mystery of the sun's diminishing in winter and growing stronger in summer. Meanwhile, Ereshkigal reigns, as she should, over the "Land of No Return," at least for the present. In this story, Ereshkigal gives up her sole rulership of the Underworld for the sake of her passionate love for Nergal. The story begins with an affirmation of the fundamental separation between the gods of Heaven and the Underworld. Ereshkigal cannot meet directly with the great gods Anu, Enlil, and Ea, to whom she is intimately related. The gods therefore send a messenger to her, inviting her to send her own servant to receive her portion of their divine banquet in the heavens. Ereshkigal sends her faithful minister Namtar, who climbs "the long stairway to heaven" and is respectfully received. Only Nergal, the god of war and diseases, refuses to stand in his presence. Nergal is required to make restitution for his insult by descending into the Land of No Return. The wise and compassionate Ea assists Nergal by providing him with seven demons to protect him. Ea also instructs Nergal not to accept the hospitality he will be offered as Ereskigal's guest, especially, "not to do with her that which men and women do." "Erra (Nergal), the lover of my delight! Erra, the lover of my delight! I did not have enough delight with him before he left!" Ereshkigal disatches Namtar with a touching message for the gods. She speaks of her loneliness as a young goddess separated from those she loved, and complains of her difficult burdens as the ruler of the Underworld since an early age. Finally she threatens that if her lover is not returned to her, she will cause the dead to rise and outnumber the living. Another six days of passion ensue. On the seventh day, the supreme god Anu sends the couple a message. The text here is once again incomplete, but it is clear that Nergal is to remain in the underworld as its new king, with Ereshikgal as his queen. 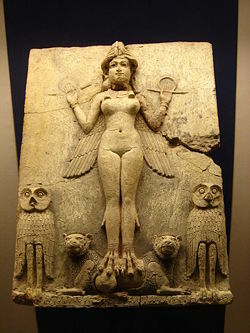 Ishtar's Descent, dating back to ancient Sumerian times, is believed to symbolize the changing of the seasons. It is also intended to illustrate certain doctrines or rituals developed in the temple-schools of Mesopotamia regarding the fertile life of this world and the deathly realm of the Underworld. The story of Ereshkigal and Nergal is thought to be a later legend told in the context of a more warlike and male-dominated Babylonian culture. This being a relatively late myth, historians of religion see it as part of the general trend in Mesopotamian religion, in which originally supreme or co-equal goddesses came to be replaced or dominated by their male counterparts. Ereshkigal, the Underworld, and her demonic minions seem to have been the origin of Greek traditions such as Hades and the demonic powers, as well as such legends as the story of the Persephone. The Hebrew concept of Sheol is closely related to the Mesopotamian concept of the Underworld, but the monotheistic tradition did not allow for a goddess such as Ereshkigal. Nevertheless, she may be related to the Hebrew tradition of Lilith. More recently, the theme of the descent of Ishtar into Ereshkigal's realm has been interpreted as symbolic of any woman's journey into the realm of the deep unconscious and to bring an awareness of its mysteries into the realm of the here and now. This page was last modified on 18 August 2017, at 21:09.